Starbucks has opened a new coffee shop in Washington D.C designed to serve all customers equally. The fact is that all of its employees speak American Sign Language (known as “ASL”) perfectly, which allows them to communicate without problems with deaf people. Under the name “The Signing Store”, this establishment is located in the street of the Gallaudet University, a bilingual university (English and ASL) for students with hearing disabilities. In turn, this café is inspired by a similar Starbucks in Kuala Lumpur, which opened in 2016 with 9 employees with hearing problems. In addition, this Starbucks has its own decoration with a mural designed by a deaf artist, paintings that make winks to sign language and even the name of the brand is translated into elements such as the apron of the employees or the umbrellas on the terrace. 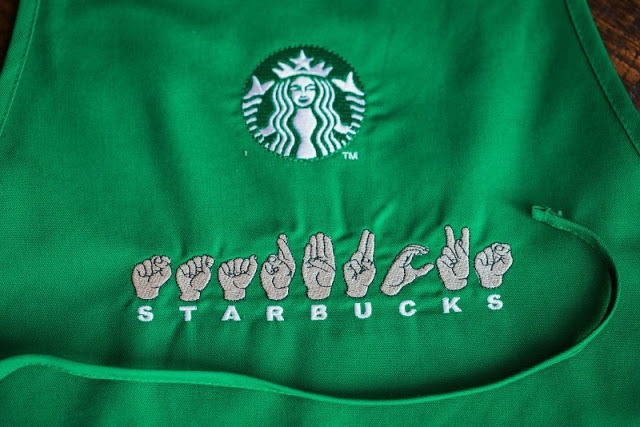 They have developed exclusive cups as merchandising of this establishment, also designed by the deaf artist Jena Floyd.